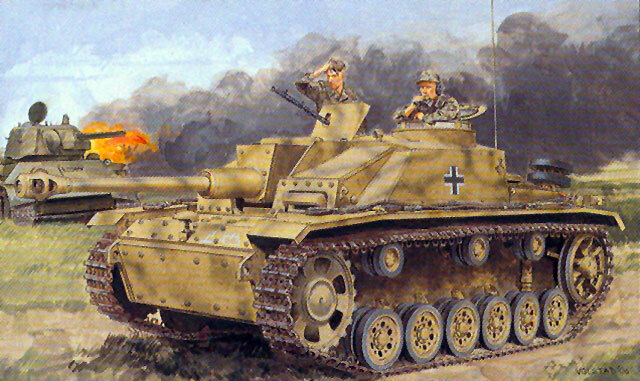 Once modelers get past the big lumpy German tanks like the Tigers and Panthers, their next most popular vehicle is usually the Sturmgescheutz series of self-propelled guns, with the later models being the most popular. For a number of years, arguments and discussions have been carried out about whose kits are the best – Tamiya (old) or Tamiya (new), DML (ex-Gunze Sangyo) or DML (Dragon's own kits.) With this new (and surprise) kit, DML seems to be out to settle all bets in one go. This kit provides the "early production" – e.g. welded mantelet/recoil cover vice the later "Saukopf" mantelet – version of the Ausf. G.
The kit comes with many of the accouterments seen on kits like the DML Tiger I and Panther, starting with individual torsion bars and road wheel arms as well as all of the external details on the lower hull such as shocks and bump stops. Each idler wheel consists of five parts with twin brass inserts between the plastic castings. All wheels are detailed to the point of having the rubber tire manufacturer's data readable! The brass is provided only for those bits where plastic cannot do the job, such as the aforementioned wheel rims and the air intake and exhaust grilles on the engine deck plus some non-slip gridding. I noted on the internet the last time critics showed up to complain about the "Smart Kit" Panther Ausf. G that it didn't come with enough brass to suit them; these people apparently can't grasp the concept of a "Smart Kit" being one which does not NEED that amount of brass to look good. But I digress. All fender details are separate and go on in subassemblies. In point of fact, most of this model consists of subassemblies, which is how it gets its tremendous level of details. This also shows in the sprues, as for example the "A" wheel sprue actually consists of seven sub-sprues, so future kits can be done by gating off or ungating other sections of the master sprue to meet the need of those kits. DML seems to be getting smarter in their old age, using this technique vice tossing in 5-10 other sprues from other kits to get one part from each one. The kit comes with a high level of interior parts, including the gun, commander's cupola assembly, floor, and the radios and stowage racks for various bits on each side of the casemate. Likewise the engine deck consists of several subassemblies combined to form the deck. Note that every hatch on this vehicle can be opened for display of the interior, but there is no engine or transmission provided. Five different finishing options and a targeted Cartograf are provided: 2nd StuG Abt. 2nd SS Panzer Division "Das Reich", Russia 1943; Pz.Gren.Div "Grossdeutschland" Eastern Front 1943; U/I unit, Eastern Front 1944; 3rd SS Panzer Division "Totenkopf",Ukraine 1944; and a token captured example, "Aleksandr Suvorov" of the 1288th SP Gun Regiment, Ukraine 1944. The latter two are in whitewash winter schemes. Input on this kit was provided by Minoru Igarashi, Tom Cockle and Gary Edmundson. Overall, this is another hit.